A warmer planet and rising fuel prices could mean that UK fisheries will face decreased profits by 2050, say NERC scientists investigating how different climate change scenarios could affect the fishing trade. The study, published in the journal Fish and Fisheries, showed that even without taking into account rising fuel prices, climate change will cost fisheries at least ten per cent of their profits. Rising ocean temperatures caused by climate change will cause many of the fish species that are important for the industry to shift northwards. 'Even though the habitat is becoming more suitable, it actually causes the potential numbers of fish to fall because there isn't enough productivity at the bottom of the food chain to support a higher population,' she explains. 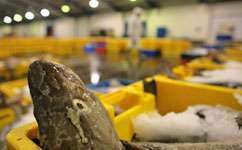 In the UK and Ireland commercial fishing continues to be an important industry, but many commercially important fish species have been over-exploited in recent years. As their numbers have dwindled so has the number of fish being caught each year. 'This lack of resources, coupled with an almost-constant price of fish on sale has meant the fishing trade has been hit hard economically, and that's only going to made worse by climate change,' explains Jones. Governments have tried to combat the economic problems of the fishing industry with subsidies, including support for buying fuel, which have helped the trade stay profitable, but they have also allowed the trade to continue catching the over-fished species, putting even more strain on the already-stretched resources making the fishermen's catch ever lower. Without increasing subsidies above current levels, the research showed that if fisheries continue on as they are rising fuel prices could cause fisheries to lose nearly 15 per cent of their profits by 2050. 'Fuel prices have risen greatly since 2005 but the increase we see in fuel price is not compensated for by an increase in the price of fish at sale, which means that if we continue to see this steep rise in fuel prices the profits of the fishing industry will be decreased further,' Jones says. The study suggests several measures that fisheries can use to try and raise profits by combating lower catches. 'Some fisherman have already learnt to stay closer to port so they don't use up as much fuel. Or they don't fish in stormy weather when fuel consumption would increase,' says Jones. 'Fuel price is increasing so much that fisherman need to adapt to reduce their fuel use, but they can also try to increase their fish catches. So for example they might put more effort into fishing, such as fishing for longer, they may alter their distribution to follow the fish shoal, or they may diversify in terms of which species they catch,' she says.